Taste test: These are excellent smallish, round tortilla chips. 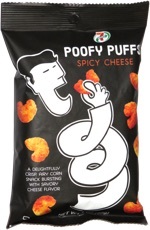 They have a great chili taste (more chili than cheese), a nice texure, and great, crisp crunch. It's not a 5-alarm chili by any means, as there's no major heat to these, but they're quite flavorful. They were very popular around the chip bowl. 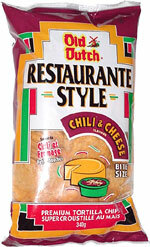 And Old Dutch included lots and lots of these chips in this medium-size bag, so there were plenty of chips for everybody. Smell test: Mild but nice chili aroma.